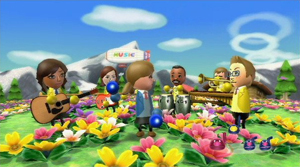 A freeform music game that simulates 66 musical instruments using the Wii Remote and Nunchuk. Play along to a selection of songs, rate your own performance and share it with friends over the Nintendo Wi-Fi Connection. 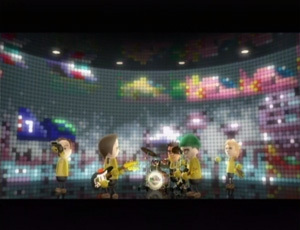 Either fill a performance with your own Mii performers, or play alongside the CPU musicians, the Tutes. You can take tutorials in different musical styles with composer Sebastian Tute. There are also four minigames to play: Drums, Mii Maestro, Handbell Harmony and Pitch Perfect. Completing minigames will unlock new instruments in Jam Mode. 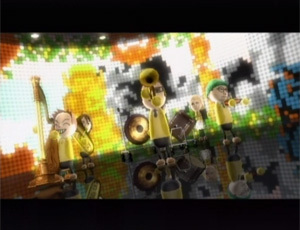 Several of the songs are based on music from other games. They appear on the menu next to images of the system they are from. When you play that track on the Electro Stage, a background themed on that game will appear. The main overworld theme from The Legend of Zelda (NES). On the Electro Stage, the background will show sprites from the game. A rock and grass field appears (based on the title screen graphics) and depending on the number of human players in your band, you will also see Octoroks, Link, Fairies, Moblins, Heart Containers and Triforce Pieces. The Mute City theme from F-Zero (SNES). On the Electro Stage, Mute City appears in the background. Depending on how many human band members you have, F-Zero machines appear, racing from left to right. The four original F-Zero machines appear: Blue Falcon, Golden Fox, Wild Goose and Fire Stingray, and they are joined by White Cat and Red Gazelle. The Ground theme from Super Mario Bros. (NES). On the Electro Stage, the background is the Ground type stage. 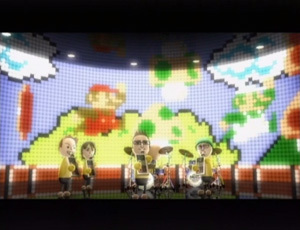 Depending on the number of human band members, you will see sprites of little Mario, little Luigi, Coins, Starman, Super Mushroom and 1UP Mushroom. 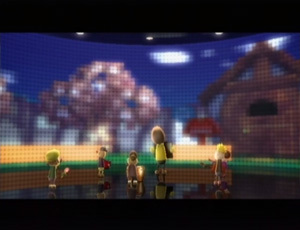 On the Electro Stage, the background simply shows an empty Animal Crossing village changing through the seasons and from night to day. The K.K. Slider song K.K. Blues from the Animal Crossing series. 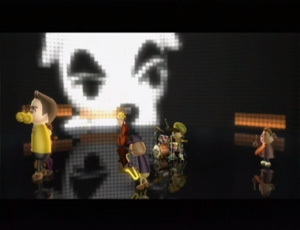 On the Electro Stage, an animated image of K.K. Slider appears, playing his guitar. The title theme from Wii Sports (Wii). On the Electro Stage, the background changes to the different sports you can play in Wii Sports: a tennis court, golf course, baseball field, bowling alley, and boxing arena. 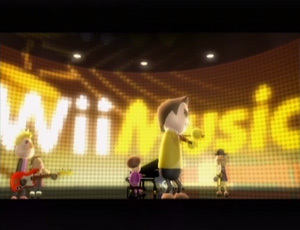 On the Electro Stage, the background simply shows the logo and various musical notations as they appear in the game. One of the wind instruments is named the NES Horn. It's shaped like the NES controller (or the Famicom controller in Japan) and plays 8-bit sound effects. When playing the NES Horn, press Down on the D-pad and your Mii will hold the flute over its head and an image of the Triforce from The Legend of Zelda series will appear. This pose is similar to the one adopted by Link when collecting Triforce pieces in the original The Legend of Zelda on NES. 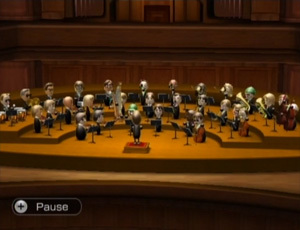 The final challenge in the Mii Maestro minigame is an orchestral rendition of The Legend of Zelda theme. This version is different to the one in the Jam mode, as it also features the Hyrule Field theme from The Legend of Zelda: Ocarina of Time.